Home »Posts Tagged "Online activity"
Trust what you see here. You will be amazed by the volume and scale of activity on the internet if you look from the sky. 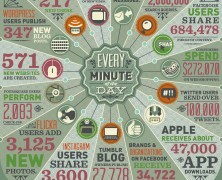 How much data is generated every minute? Our digital activity creates terras of data on a daily basis and few of us realize this effect of magnification. The truth is that a world without internet would be totally different but definetly not better. If you belong to the generation X or Y likely you cannot even imagine it.